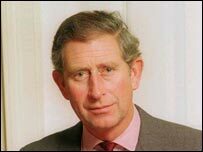 Clarence House says it may sue a Sunday newspaper after it printed extracts from diaries kept by Prince Charles during a 1997 visit to Hong Kong. It said it was considering legal action against the Mail on Sunday because the diaries were "unlawfully obtained". The diaries were kept during the Prince's official visit to the territory for the Chinese handover. In the journal, he described Chinese diplomats at a ceremony as "appalling old waxworks", the paper reported. He also allegedly called a speech by then-Chinese president Jiang Zemin as propaganda, and slated the function as an "awful Soviet-style" performance. The newspaper reported that the Prince wrote: "After my speech, the President detached himself from the group of appalling old waxworks who accompanied him and took his place at the lectern. "He then gave a kind of "propaganda" speech which was loudly cheered by the bussed-in party faithful at the suitable moment in the text." A Clarence House spokeswoman said: "It is quite clear to us that the source for this story is material that was unlawfully accessed and copied and then handed to the Mail on Sunday. "The Mail on Sunday had full knowledge of these facts, yet they still chose to use the material as the basis of their story." A spokesperson for the newspaper said: "As far as the Mail on Sunday is concerned this has been a classic journalistic exercise and we came into possession of the text of the journal entirely legitimately. "Clarence House is wrong to suggest otherwise," the spokesperson said. The prince is said to regularly write journals of his official visits, around 100 copies of which are then circulated to friends, relatives and contacts. 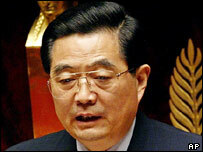 Details from the diary come days after an official visit to the UK by Chinese president Hu Jintao.